He speaks to us through his Word. 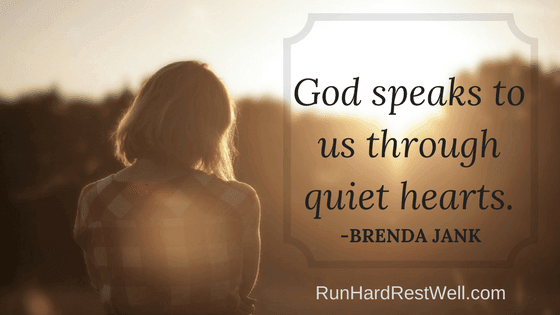 God speaks to us through quiet hearts. Jesus desired the presence of his Father. Do you think he was homesick? Am I ever homesick? Do I ever long for the presence of my Father? Over the years, prayer for me has moved (and is moving) from getting things to getting God. Part of that journey includes dialogue—embracing a relational attitude to prayer. It’s about learning to listen to God, not only in his Word (which is primary), but how to listen to God in stillness. For me, listening to God in prayer is attending to his presence. It is being still. It is knowing he is present. It is entering into a stillness that is quiet enough to hear his heartbeat and his song. It is where I feel most deeply loved. Stillness reminds me I occupy a treasured place in the heart of God. This promise is found in Psalm 46:10a. I can not see God. I can not hear God. I can not feel God. But I can know God. And in knowing God, he assures me of my identity, directs my footsteps, and shapes my heart’s desires. * For the warriors among us, visit this verse in the Holman Christian Standard Bible – Zephaniah 3:17. Ah, the stillness! Awakened at 3:30, I prayed, Lord help me go back to sleep. I’m so terribly exhausted. Help me go back to sleep…..but if not….speak into my spirit the prayers I’m to pray, the words I’m to hear, or just fill me with Your Presence. I didn’t sleep. I didn’t have prayers for the others I expected. I didn’t just feel His Peace surrounding me. Instead, He and I ruminated over a worry I had. I was full of anger at the thoughtlessness of another. I was making plans for ME. This is what I would do. I love that God listens….even to my ugliness. After a short time, He reminded me of two stories in the New Testament. The first, when He was exhausted and grieving the loss of John. The second, the woman with the issue of blood. Now why these? Where did they come from? What did they mean? Jesus, put Himself out there….even when it wasn’t convenient. He put Himself out there when He was needed. And, He assured me that as I did the same, I would be strengthened and enabled to meet a need that I didn’t want to meet. Life with Christ isn’t easy, or convenient, nor does it make sense, but when we can find that time of stillness…..and Jesus help us do just that….it is so worth it! Into the darkness. Sleeplessness. Loss. Loneliness. Betty – Once again, words to encourage us all. His Word is alive and a daily gift. May He meet you this week, in very intentional quiet places amidst the booms inside and out. 4th of July, were we come!